Students at different levels of education are often required to write analytically. At middle or high school, they may need to write (for example) an analysis of the causes of an accident. At university, they may need to write analytical essays to examine the relationship between two concepts or ideas. However, many students find writing analytically a daunting task. They tend to be more familiar with descriptive writing, having learned how to write stories for many years, and may be at a loss about what to do when they are asked to produce a familiar text type. Some weaker students may even fail the task simply because they lack the necessary writing skills. To help them solve this problem, I have developed some tasks which aim to prepare students to write an analytical report about a disaster. I have used the materials with my university classes, with positive response. I will now describe the procedure for each task and outline the rationale for the design. Divide the students into pairs, then play the video. Ask Student A to pay attention to what happened in the disaster (description), and ask Student B to focus on the cause and effect (analysis). In pairs, students summarize what they have watched to each other in 1-2 minutes. Invite one or two pairs of students to give a mini-presentation on the disaster to the whole class. Ask them to imagine that they are news reporters. Have the class give feedback on the mini presentations. For example: Is the description accurate? Is the analysis helpful? Rationale: Language skills are typically integrated in real life, so students shouldn’t need to write all the time in writing lessons. In this activity, students talk about what happened in a disaster and discuss its causes. By doing the activity, students will practise or learn useful vocabulary and structures for discussing disasters. This preparation will make the writing task later more manageable. Find a written report of the disaster selected for the above activity. Online news sites, Wikipedia and government official reports are good sources for this. The following is a sample Wikipedia article on the Turkish Airlines Flight 981: https://en.wikipedia.org/wiki/Turkish_Airlines_Flight_981. The first paragraph of the article explains what happened in the accident while the second paragraph examines the causes. Cut out two short extracts (5-6 sentences each) from this report. One extract may be about the events which happened when the disaster struck, while the other may discuss a cause or a consequence. Give the sentences to the students. Ask them to decide on the purpose of the two sets of sentences: to describe or to analyse? What helps them arrive at the answers? Rationale: This reading activity aims to raise students’ awareness about the language features that are commonly found in descriptive or analytical writing. For example, time expressions such as “after” and “in the same year” are frequently used to sequence events in a descriptive text, while other expressions (e.g. “attributed to” and “resulted in”) are found in analysis of cause and effect. Now have students read two longer passages about the disaster. Each passage may consist of 3-4 paragraphs so that it is long enough to present a mini descriptive or analytical account of the incident. The Wikipedia article mentioned in Task 2 may be used again. In pairs, each student reads one of the passages and answers some questions about it. They should indicate their answers by putting a tick or a cross in the appropriate box in a table (see below). 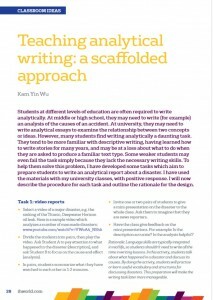 This step is intended to help students notice the features of analytical writing. Pairs of students compare their answers. Finally, the class decides which passage is more analytical and which is more descriptive. 2. Explains the significance of what happened. 3. States the different causes. 4. Evaluates the importance of different causes. 6. Uses evidence to support the assertions. Rationale: The questions in the table have been adapted from a guide to critical writing (University of Birmingham, 2015). The features that are relevant to descriptive writing are items a, c, e, f while those that apply to analytical writing are items b, d, f, h. The assumption of this activity is that students best learn about all these features by noticing how they are used in real texts, and not by listening to the teacher’s explanation alone. Each student writes a paragraph analyzing one major cause for the disaster, and the consequences. Students give peer feedback to each other, commenting on whether the features listed in the above table are found in the writer’s paragraph. Select one paragraph written by a student (preferably from another class). Demonstrate how you would edit it, focusing on language choices and the features of analytical writing. With advanced students and access to the computer, use Google Doc to display the paragraph in class so all students can participate in editing it. Rationale: Feedback on writing is most useful before students’ assignments are graded. This activity allows students to receive comments before they write the upcoming analytical reports. Students write an analytical report on the disaster, building on the paragraph they have written and the feedback they have obtained. Advanced students may be asked to research into another disaster of their choice and write a report on it. The above tasks have been sequenced carefully in an effort to scaffold learning. I think it makes sense to begin with speaking preparation before students start to write. I also believe that students need to see how authors write analytically before they attempt it themselves. Above all, students need to know what makes a passage analytical, and a self-discovery approach like the one described here is more effective than a deductive one. Although the above activities can be selected as a package, teachers could combine them with other tasks or exercises flexibly. Alternatively, they could have their students do one or two of the activities only. With tailored support and assistance, students should be able to achieve the goal of writing analytically. https://intranet.birmingham.ac.uk/as/libraryservices/library/skills/asc/documents/public/pgtcriticalwriting.pdf [Accessed 26 October 2017]. Kam Yin Wu has extensive experience teaching English at all levels of proficiency. He has also worked as a teacher educator. Currently, he is an English Lecturer at the Hong Kong University of Science and Technology. He has published journal papers as well as teaching materials for commercial publishers. His primary research interest is in teaching writing.